Shatter rings are circular to elliptical volcanic features, typically tens of meters in diameter, which form over active lava tubes. They are typified by an upraised rim of blocky rubble and a central depression. Prior to this study, shatter rings had not been observed forming, and, thus, were interpreted in many ways. 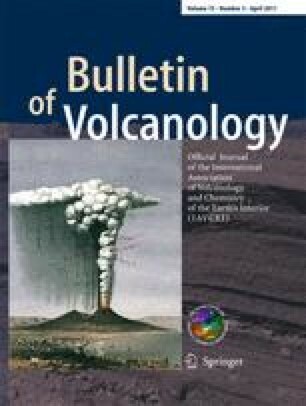 This paper describes the process of formation for shatter rings observed at Kīlauea Volcano during November 2005–July 2006. During this period, tilt data, time-lapse images, and field observations showed that episodic tilt changes at the nearby Pu‘u ‘Ō‘ō cone, the shallow magmatic source reservoir, were directly related to fluctuations in the level of lava in the active lava tube, with periods of deflation at Pu‘u ‘Ō‘ō correlating with increases in the level of the lava stream surface. Increases in lava level are interpreted as increases in lava flux, and were coincident with lava breakouts from shatter rings constructed over the lava tube. The repetitive behavior of the lava flux changes, inferred from the nearly continuous tilt oscillations, suggests that shatter rings form from the repeated rise and fall of a portion of a lava tube roof. The locations of shatter rings along the active lava tube suggest that they form where there is an abrupt decrease in flow velocity through the tube, e.g., large increase in tube width, abrupt decrease in tube slope, and (or) sudden change in tube direction. To conserve volume, this necessitates an abrupt increase in lava stream depth and causes over-pressurization of the tube. More than a hundred shatter rings have been identified on volcanoes on Hawai‘i and Maui, and dozens have been reported from basaltic lava fields in Iceland, Australia, Italy, Samoa, and the mainland United States. A quick study of other basaltic lava fields worldwide, using freely available satellite imagery, suggests that they might be even more common than previously thought. If so, this confirms that episodic fluctuation in lava effusion rate is a relatively common process at basaltic volcanoes, and that the presence of shatter rings in prehistoric lava flow fields can be used as evidence that such fluctuations have occurred. The online version of this article (doi: 10.1007/s00445-010-0414-3) contains supplementary material, which is available to authorized users. I thank the staff of the Hawaiian Volcano Observatory for many important field observations and useful discussions about shatter ring behavior. Roger Denlinger and James Kauahikaua provided valuable insight into the fluid mechanics of lava. Finally, I am grateful to Matthew Patrick, Richard Hoblitt, Scott Rowland, and Sonia Calvari whose helpful comments improved this manuscript. This work was funded by the U.S. Geological Survey’s Volcano Hazards Program.